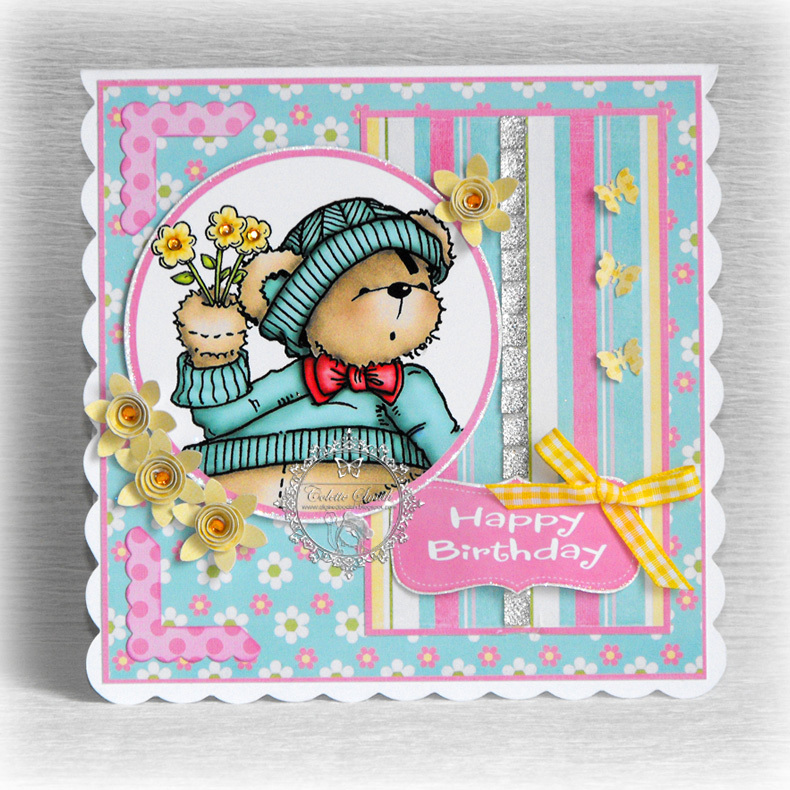 I thought you may like to have a look at this card I made using a fabulous Redonkulous image. I didn't add much in the way of embellishment to the card as the image and sentiment say it all, but I did use some assorted size gems from Meiflower to help point you in the right direction LOL! 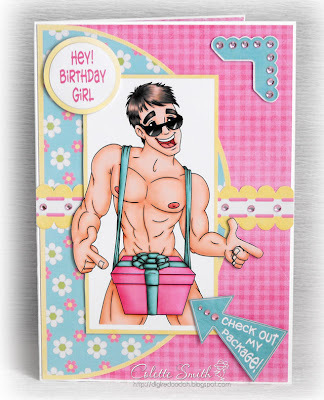 Most of us probably know a few people who would appreciate this fun card. I love the sparkly dazzlers from Meiflower (you can order via phone) they really are super sparkly and as I added the word sparkle to this card I thought they would be perfect embellishments, I added heart shapes to the sentiment and made a corner embellishment with some square ones. The lovely spring green satin ribbon and wish charm are also from Meiflower. The image is Teddy Bea Fairy woof woof. Today I wanted to show you how I have used a Meiflower diamante ribbon slider and 10mm satin ribbon to make a flower centre. I usually use pearls, gems or glitter, but this time I decided to do something different. I took a small length of satin ribbon and made it into a loop using double sided tape, I then threaded the loop through the ribbon slider and fixed into place with more double sided tape. I quite like the way it looks and it makes a change from my usual flower centres. Today I have a card to show you using a pretty butterfly charm, some gorgeous cerise gems and spotty grosgrain ribbon all from Meiflower. 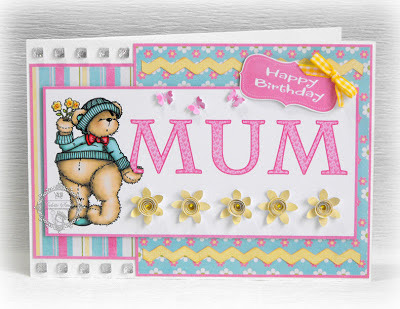 The writing on the image of the card should say MUM, but I cut off the M's and used the U as part of the sentiment. 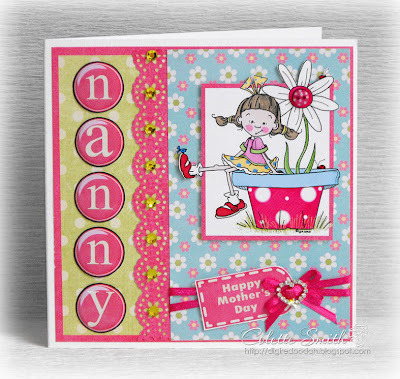 Today's card is for a special nanny for Mother's day, I just happen to know that this particular nanny likes a bit of bling, so I made sure there was some sparkly bits on her card by adding some fabulous lime green stick on crystals and a diamanté ribbon heart slider all from Meiflower. 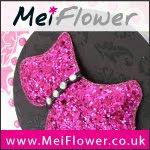 Meiflower have some fabulous new embellishments in stock (not on website yet, but you can order them by telephone). They come in square, rectangle, circle and cats eye shapes and look like the shapes are covered in pave diamonds, very sparkly! The photos don't do them justice. I have a big stash of Meiflower buttons, but because I love sparkly stuff so much I often forget to use them, so today I have made a card that has absolutely no bling whatsoever, I have made these beautiful damask buttons the focus of the design, and have kept the card layout very simple. 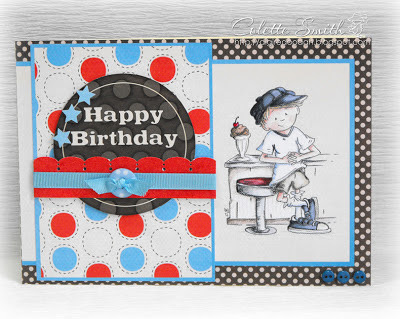 The buttons are also available with the design in white, and Meiflower also have a large selection of small polka dot and plain buttons in a huge variety of colours, as well as some spotty, stripey and gingham designs. Unfortunately you won't find the buttons on the website at the moment, but if you ring your order through you will be able to get them that way. Maybe I'll pluck up the courage one of these days LOL!